(Bloomberg) -- Steinhoff International Holdings NV identified eight people, including former Chief Executive Officer Markus Jooste, as those allegedly behind questionable transactions that brought the global retailer to the brink of collapse. The company was compelled by a South African parliamentary committee to release the names even as Chairwoman Heather Sonn and CEO Louis du Preez warned it could jeopardize investigations and break European privacy laws. The revelations follow a forensic probe by auditor PwC that uncovered 6.5 billion euros ($7.4 billion) of irregular transactions with eight firms from 2009 and 2017, according to a summary released Friday. 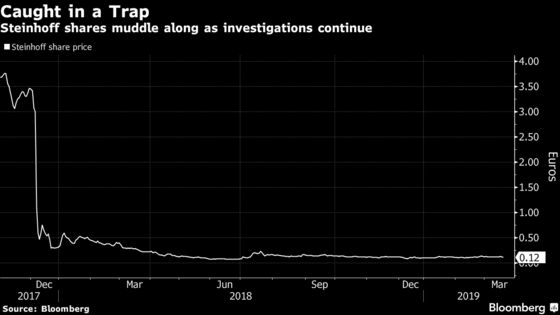 The deals, orchestrated over several years, enabled Steinhoff to artificially boost profits, puff-up property values and inflate cash, the probe found. “We want the emphasis to be on prosecutions,” Sonn told lawmakers in Cape Town on Tuesday. The names were released as Steinhoff, the owner of Conforama in France and Mattress Firm in the U.S., said it remains in a “precarious position.” The retailer is seeking to complete agreements with creditors after revelations of accounting irregularities in December 2017 erased almost 95 percent of its market value. An elite South African police unit known as the Hawks told lawmakers that one investigation into fraud is at an advanced stage, and that the probe has been extended and its team “enhanced” so wrongdoers can be brought to justice. Jooste, Schmidt, Schreiber, La Grange and Grobler didn’t answer their phones or respond to text messages requesting comment. A person who answered the phone at a company where Evans, Romano and Pasquier are listed as directors said Evans and Romano were out of the office. Emails sent to Romano and Evans weren’t immediately replied to. An automated reply from Pasquier said he is out of the office until March 25 and referred queries to Romano. Even after PwC spent more than a year probing the accounts, Steinhoff plans to dig deeper into the alleged misdeeds because questions remain over “the true nature of the counterparties or the ultimate beneficiaries to various transactions,” the company said in the summary released Friday. The retailer is currently preparing its 2017 and 2018 audited earnings, due next month. The cumulative effect of all prior-year restatements will be disclosed in the 2017 annual report, and the PwC forensic findings may influence the audit opinions, Du Preez said. That is, if the writedown of total equity surpasses 11 billion euros ($12.5 billion), the company will notify the market before the results are released April 18. The Hawks were chastised by Yunus Carrim, the chairman of parliament’s oversight committee on finance, for taking so long to investigate the matter. Lieutenant General Godfrey Lebeya said that the unit is taking the probe seriously and that having the names of those alleged to be involved will help the investigation. The parliamentarians pushed for the police to secure the PwC report from Steinhoff within 24 hours. Jooste in September told South African lawmakers that the origin of the company’s woes related to a protracted dispute with a former partner. He also said he wasn’t aware of the financial irregularities reported by the company the day he quit. The parliamentarians on Tuesday criticized Jooste for not cooperating with the PwC investigation, while the Financial Sector Conduct Authority has issued a summons to Steinhoff for the full report. The Independent Regulatory Board for Auditors said it’s waiting for the restated 2015 and 2016 results before continuing its probe, which centers on why Deloitte South Africa signed off on the accounts. IRBA said it will also be asking for the full PwC report.